Treasury Secretary Timothy Geithner's apparent openness to a non-dollar reserve currency roiled markets on Wednesday before he backtracked and said the dollar would maintain its current central role. Geithner had said at a Council on Foreign Relations event that he was "quite open" to China's suggestion to displace the greenback with an "international reserve currency." China central bank governor Zhou Xiaochuan had called for a global currency to replace the dollar, perhaps a "reserve currency" from the International Monetary Fund. The odd thing, though, is that Geithner expressed what appears to be the alternate view a day earlier. During a congressional hearing Tuesday on Capitol Hill, Rep. Michele Bachmann, a Minnesota Republican asked this question to Geithner and Fed Chairman Ben Bernanke: "We've seen both China, Russia, Kazahistan make calls for an international monetary conversion to an international monetary standard as soon as the G20. And I'm wondering, would you categorically renounce the United States moving away from the dollar and going to a global currency as suggested this morning by China and also by Russia. Mr. Secretary?" Then there was President Obama's press conference a few hours later. CBS News has posted the transcript, which captures the president saying -- also unambiguously -- "I don't believe that there's a need for a global currency." All of which makes Geithner's comments a bit inexplicable. Zhou, the China central bank governor, had suggested that there were too many "inherent vulnerabilities and systemic risks in the existing international monetary system," and a new approach would help "to achieve the objective of safeguarding global economic and financial stability." The spectacle of the U.S. treasury secretary appearing to talk down the dollar shocked financial markets. The U.K. Telegraph's Ambrose Evans-Pritchard wrote that "the dollar plunged instantly against the euro, yen, and sterling as the comments flashed across trading screens." Geithner made those comments at an event moderated by former Treasury official Roger Altman, who gave him a chance to clarify his remarks. 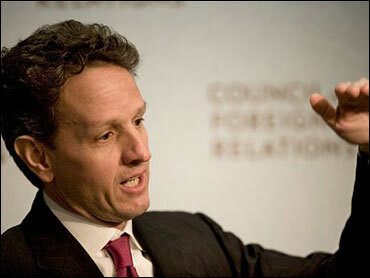 "The dollar remains the world's dominant reserve currency," Geithner said later. "I think that's likely to continue for a long period of time." If the dollar loses its de facto reserve currency status -- perhaps as a result of the Federal Reserve printing too much money -- it would likely sink against other currencies, making imports and commodities like oil and metals more expensive for Americans to buy. And because China is the U.S. government's largest single creditor, it has more to say about this than just about anyone else.